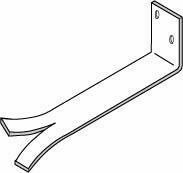 The heavy straight bracket is in principle the same as the "L" bracket, however it does not have the 50mm (90 degree) return. Also used for fitting timber to brick work. Please note: the illustration shows an "L" bracket, not a straight bracket.